VERNON, British Columbia, Nov. 13, 2018 (GLOBE NEWSWIRE) -- True Leaf Medicine International Ltd. (“True Leaf” or the "Company") (CSE: MJ) (OTCQB: TRLFF) (FSE: TLA), a plant-forward wellness brand for pets and their owners, today announced it has added seven hemp-based products specially formulated for cats to its True Hemp™ product line, to be available in pet stores and online across Europe. 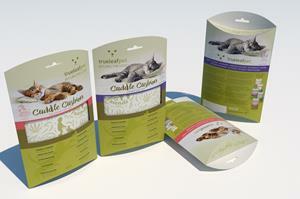 The new products for cats include five hemp-based treats and two hemp toys. The innovative treats have a crunchy outer shell and a soft inner core with hemp. The True Hemp™ functional treats come in five formulas to address common feline health concerns: Calming, Skin+Coat, Anti-Hairball, Urinary Tract support, and Senior, a formula that promotes hip and joint health in adult cats. True Leaf Pet, a division of True Leaf, pioneered hemp-seed-based products for dogs. The Company’s True Hemp™ line of functional chews, supplement oils, and dental sticks is one of the first to be marketed worldwide and is now sold in 2,800 stores across North America and Europe. Earlier this month, True Leaf launched e-commerce direct-to-consumer stores in three major European markets. Pet owners in France, Germany, and the United Kingdom can now shop for True Leaf Pet products online at www.trueleafpet.eu and have them delivered directly to their door. In France, the online store launch marked True Leaf’s entry into the large French pet market valued at 4.6 billion euros (Source: Euromonitor 2017).